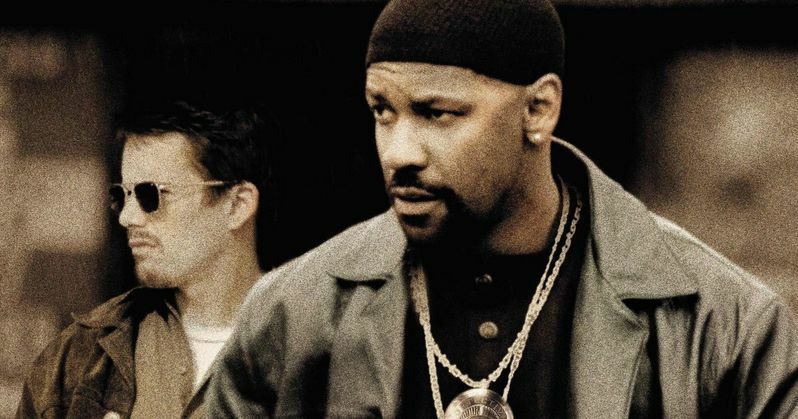 Warner Bros. Television, director Antoine Fuqua and producer Jerry Bruckheimer are teaming up to develop a new TV series based on the hit 2001 movie Training Day. The producers will pitch the project to all four major networks (NBC, ABC, CBS and Fox) for a series that will be written by Will Beall (Gangster Squad). Deadline reports that it was Antoine Fuqua's idea to turn Training Day into a TV series. Training Day starred Denzel Washington as LAPD detective Alonzo Harris, who shows Jake Hoyt (Ethan Hawke) the ropes on his first day as a narcotics officer. Jake learns quickly that Alonzo and the rest of his team are dirty cops. The series will be set in the present-day LAPD, set 15 years after the original movie, focusing on a relationship between two similar cops. The series may feature a new twist, with the corrupt, older cop being white, and the younger detective being black. Training Day earned over $100 million worldwide, with Denzel Washington winning an Oscar for Best Actor, and Ethan Hawke receiving a Best Supporting Actor nomination. Before turning to a career in writing, Will Beall was a former LAPD detective himself. He served as a writer and executive story editor for ABC's hit crime drama series Castle before writing the script for Warner Bros.' Gangster Squad. He is also writing upcoming projects The Legend of Conan and Robin Hood. If Training Day moves forward, Antoine Fuqua will direct the pilot episode. The filmmaker will also executive produce alongside Jerry Bruckheimer, Will Beall and Jonathan Littman, with KristieAnne Reed serving as co-executive producer. It isn't known if original Training Day screenwriter David Ayer will be involved in the TV series or not. He is currently filming Suicide Squad, Warner Bros.' upcoming superhero movie, in Toronto. If Training Day does happen, it will be just the latest in a spate of movies that are being adapted into TV shows. This fall TV season will bring the debuts of Fox's Minority Report and CBS' Limitless, along with the midseason premieres of ABC's Uncle Buck and CBS' Rush Hour. Do you think Training Day will work as a weekly TV series? Chime in with your thoughts, and stay tuned for more developments.